Awesome Anolon Pancake Pan Giveaway! Silver dollar pancakes made easy—Ten winners will snag this handy pan in our Awesome Anolon Pancake Pan Giveaway! Petite pancakes, coming up! Enter to win this awesome Anolon Silver Dollar Pancake Pan today—a $30 value! There’s just something extra fun about tiny versions of our favorite foods, no? And well, we like pancakes (in case you missed the protein pancake recipe, here’s a link to that post—and see the pretty pancakes that resulted from that recipe plus this cool pan, below right). Know what else we like? Portion control—especially when it comes to scrumptious things like pancakes where it’s easy to go a little crazy. The kind folks at Anolon sent us a Silver Dollar Pancake Pan to try out, and the portion control aspect was one of our favorite aspects of this pan! The Anolon Classic Hard-Anodized Nonstick 12-Inch Silver Dollar Pancake Pan makes seven perfectly sized silver dollar pancakes. All you do is fill the circular impressions in the pan with your favorite batter. The heavy-duty hard-anodized aluminum construction provides fast, even heating and the restaurant-tested DuPont Autograph® 2 nonstick interior is metal utensil safe. Flipping is not hard since the indentations are not deep, nor are the sides of the pan deep, so it’s not awkward to get in there to flip your cakes. And, much to our relief, the finished pancakes come out easily—thank goodness, because wasted pancakes are never a happy thing! You can find this nifty pan in stores this month, as well as online via the Anolon site and other retailers. It would make a nice little gift for a housewarming, a wedding shower or (gasp! ), maybe you’re thinking about getting an early start on your holiday shopping! Maybe you’d like to try and win one of these baby pancake pans—ten of our readers will win one (the lucky ducks). 2. “Like” Appetite for Health on Facebook, and please “Like” Anolon on Facebook, too. 3. Leave us a comment below (not on Facebook please) telling us why you’d love to win an Anolon Silver Dollar Pancake Pan. Remember, extra credit is given to those who share AFH nutrition or fitness articles on social media–tell us where you shared (a link is handy)! Open to US residents. Entries will be accepted until midnight EST on Friday, September 27th. All AFH Terms and Conditions Apply. my girls would be delighted to have silver dollar pancakes and my mornings will be a ted bit brighter. I am a newsletter subscriber. I like you and Analon on Facebook. I would love this so I can make healthy portion pancakes for myself and my family. I am starting a diet and I think this would be great. I have always wanted a pancake pan. The non stick coating is definitely a plus and I trust the Analon brand. I need one of these because I can’t make panckaes for anything. They fall apart when I flip them. This is the perfect pan for portion control. And nonstick is a bonus!! They are the perfect size for my kids!! With fall here, I would love to try and make pumpkin spice pancakes or apple cinnamon pancakes. I love taking advantage of all the wonder fall flavors and foods. This pan makes the perfect size pancakes for the whole family. I am subscribed to your newsletter and liked both on Facebook. I also shared a recipe with my mom for pumpkin applesauce muffins on her Facebook wall. I’d love to win the Anolon Silver Dollar Pancake Pan because I like pancakes in small portions, especially thin ones. Love to win because silver dollar pancakes are all the rage in our house and I usually make them in my non-stick frying pan. My son loves pancakes, will be a great option to cook a different flavors pancakes at the same time!! Would love to win this pan! Love nonstick! And love that you can get 7 pancakes in the pan at once! That’s usually the challenge! I love pancakes, that is reason enough. I think it would help to cut down on calories. A stack of this size is a calorie saver compared to a stack of regular size pancakes. I just started teaching my daughter how to cook – the first thing we made together was pancakes. She’d love to have this in our kitchen! My twins would love for me to have one of these to make their breakfast every morning! I love the forced portion control this pan makes us follow……great! Our kids love pancakes, (who doesn’t?) and this would be a really fun , quality pan! Thanks! My family loves silver dollar size pancakes. PANCAKES! it’s” whats” for dinner!! I would love to win coz me and my family love pancakes and this pan will make my life easier 🙂 thank u. Love the pan because everyone here is a fan of pancakes – perfect anytime of the day! Fall and apple cider pancakes, the best ever!!! We eat many pancakes and making enough for 5 and more on the weekends is too hard in my small pan, would love this Analon Pancake Pan, 7 at once is perfect. We like you both on Facebook, receive your newsletter. I would love to make small muffin-top-like dessert treats with this using healthy muffin batter (as well as pancakes, of course!). We’re currently eating a lot of whole wheat pumpkin pancakes (made with mainly eggwhites, for protein). My kids would be THRILLED if I won this pan!! They want pancakes nearly every morning… the only things that change are the ingredients (choc. chip, apple, pumpkin, peach, blueberry, the list goes on and on…) and the size (mancakes, pancakes, or babycakes). It would be fabulous to be able to make them perfect little babycakes for breakfast! More reasonable portions, this would be so handy! Because the kids love pancakes on the weekends. Grandkids love my pancakes. with one of these I can fix enough for more than one kid. Well, because I love pancakes! I would love to win because my son loves what he calls “baby pancakes” and I think I could make some excellent baby pancakes for him using this! I would love it for my wife, to make breakfast easier! My kids always want “little” pancakes. This would be so nice to have! This would be PERFECT for my little one. I liked you already and liked Anolon on FB. Smaller foods make it a lot more fun to eat and I love the portion control too! I prefer silver dollar pancakes over larger sizes, and this would keep them all the same size. I would love to make beautiful perfect sized pancakes, that’s why! I follow Anolon on Facebook where I am Margot Core. I would like to like the Anolon page but when I click on the link it has that the page no longer exists. I would love to try this with eggs, I think they would be the perfect size for making my own egg, bacon, muffin sandwiches! I shared your FB post and @lexiquin RT’d your giveaway. I love pancakes and have been wanting to get a silver dollar pan for a while! Thanks for the giveaway! I like ya’ll on FB as Mary Beth Elderton. This would make weekend breakfast so much fun—and easier. This pan would make fixing pancakes much easier. I would love to win this so I can make my gluten free pancakes into the prefect size and shape! These are perfect to make little breakfast sausage sandwiches for my little guy! I subscribe to the e-newsletter, Like Appetite for Health and Anolon on Facebook. 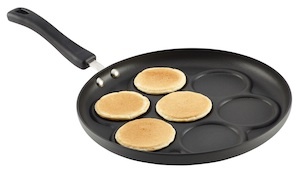 I’’d love to win an Anolon Silver Dollar Pancake Pan because I love mini pancakes. It would be wonderful to make my own. this would be the perfect size for the little ones to handle themselves. We LOVE pancakes in my house and this would be the perfect addition. Also great for adults too to help with portion control. I would love to win this Anolon Silver Dollar Pancake Pan for my family, Thank You!! We like to eat a pancake with fruit topping for dessert sometimes instead of eating them for breakfast. These would be the perfect size for dessert. Would love to try it! Awesome giveaway! Shared with my friends and family on Facebook. Awesome giveaway! Shared with family and friends on Facebook. I would love to win this pan because pancakes are my favorite breakfast food! I thinks this pan would work great in helping gluten free pancakes hold its shape. I like both AFH and Anolon on FB and receive AFH’s e-newsletter as well. My BF and I have been eating really healthy and working out for a couple years. While pancakes are a childhood favorite for both of us, I only made them once. I used two cast iron fry pans which only had room for one 6-7″ pancake and the pancakes took forever to cook or else the outside would burn to a crisp. We tried making the silver dollar size but there was not enough room in the pan. We thought eating pancackes would be a fun way to sneek wheat germ, soyflour, ground flax seeds, and other goodness into our daily diet. If I could make silver dollar pancakes with this pan, I would make a bounty on Sunday for the week and stuff our lunch bags–what a great way to curb afternoon snacking instead of hitting the vending machine or Starbucks! Find my “shared link” at https://www.facebook.com/#!/groups/564100420318276/. I would love this pan for the portion control, ease of flipping aspects of it. My kids say I make the best pancakes next to Nana. I love that its non stick!! i am the WORST “pancake maker” ever! my pancakes always get stuck and burn..
My hubby usually makes our kids pancakes .. him or (frozen) Pillsbury!! This would make cuter pancakes than the skillet I currently use!! I receive your newsletter and like you both on Facebook. I love this pan because everyone loves little pancakes! This pan gives the perfect size pancake for my little boy & me. He always requests silver dollar pancakes at the pancake house. I subscribe to AFH e-newsletter. I’d love to win this because cooking pancakes for a family of 6 with a regular pan takes FOREVER! This would simplify my morning!! My husband makes our daughter little pancakes weekly for breakfast.. this would be a great way to have the making go by faster and have them all the same size.. plus they are great bite size.. Thanks..
Oh, my boys would LOVE to have this pan in the house. I make them silver dollar pancakes, but they never turn out that perfect! tweeted one of your articles. Smaller portions and the fun idea of being able to do different style pancakes in a quick and easy way! This would be perfect for the grandkids pancakes! Follow both on Facebook and newsletter subscriber! Oops…forgot in the last comment to say that I like Anolon too on Facebook. I would love to use this pan to be able to make small pancakes that are consistent in size for easy breakfasts throughout the week. Make ahead and freeze them for later use. We often buy things that are a quick heat up that are not healthy but if we could make them ourselves and ahead of time that would be awesome and very healthy! I would LOVE LOVE LOVE to win a Anolon Silver Dollar Pancake pan because my mom used to make me silver dollar pancakes when I was a little girl and this would be PERFECT for me to make them for my daughters! My daughter would love this size for her pancakes and it would make them perfectly round too. Thanks for the chance to win one. I am a subscriber and would love to have this for my grandson’s perfect silver dollar pancakes! I love making him whole wheat pancakes and they love eating them with fresh fruit. This would help making a lot of pancakes really quick for my 3 grandson’s that I take care of. Perfect size for them as well. Anolon is definitely a brand that can be trusted for healthy cooking and I need that for 3 growing boys! My kids would love stacks of tiny pancakes, which I am just not coordinated enough to make (perfectly, of course) on my own. I could even convince my children to help me make them with a pan like this! I have always loved to eat silver-dollar pancakes. It reminds me of my childhood. I still make them that way when I cook them. Having that pan would make them easier to cook and would make them all look the same. I’d sure like to have it! The pancakes or mini cornbread would just be the right size. My husband and I love making pancakes and this would make it so easy!! I’ve been following you guys for a long time on Facebook and Twitter. I also follow Anolon. Thanks! This would be the perfect pan to make pancakes for my husband and I, we usually do not eat but one a piece and this would get it done in one cooking. Mmmm! Silver Dollar Pancakes!! Makes it alot easier NOT to put butter or syrup on them becuz they are so small — each one a DELIGHTFUL mouthful of pancake au natural!! We love pancakes! My daughter has been making some yummy multigrain pancakes for us. It would be fun to make them silver dollar size. I subscribe to the newsletter and like both Appetite For Health and Anolon on facebook. I would like to win this to make breakfast more fun for my son, he loves pancakes!! Anolon has a wonderful reputation and I have heard about them for years but never had the pleasure of owning any of their products. This would be the perfect house warming gift for my son who loves to cook and eat pancakes of any size! Thanks so much! Love pancakes and this pan would make them look and taste even better. I like things that are all the same shape and size that I why I would love this pan to make my pancakes. pancakes for these cool mornings! I subscribe via email! And ‘like’ you & Analon on FB! (Annmarie Dipasqua Weeks). This would be perfect for making pancakes at my house! My kids prefer these ‘smaller’ pancakes to the full-plate ones…and I love how this pan makes them ALL the same size! I Like both pages on Facebook and I’m signed up for the newsletter. This Anolon Pancake Pan would help to make pancakes much easier and I love hoe they would be the perfect size,too. I would love this pan for my daughter who makes the best pancakes in the world… I know her kids would love the silver dollar size! I already get your e-mails. I have liked your page for some time, and I just liked Anolon. I would love to win this pan–it would be awesome for the days we have breakfast for dinner. Would love to win – I can not make a small pancake – they always are large – so portion control would be lovely – plus it is non-stick! My husband loves making pancakes for my grandsons!!! I shared this and liked all the link above for anolon does not work. And I did tweet too!! I love silver dollar pancakes. I would give this to my sister who loves pancakes. I would love to win so I can make my handsome husband breakfast in bed. His favorite is strawberry pancakes with whip cream and syrup. Thanks! I love pancakes, and the link for the FB Anolan doesn’t work. I would love to win one to teach my sister how to make some great pancakes! omgosh! I have Anolon’s square griddle and even though I’m getting better, my silver dollars are always distorted…lol. I would love one of these pans so my little granddaughters (ages 2 and 4) won’t make fun of my silver dollars anymore! Awesome giveaway! Shared on facebook! i would love to make these at home. Plus I would make extra and freeze them for a quick and easy weekday breakfast! Easy portions for the kids, and easy to store and freeze for simple breakfast! We love pancakes at our house. My husband, unfortunately, is terrible at making consistently sized pancakes. This would help us out so very much. i have 4 kids and this would be sooooooooooo awesome to have!!! even my teen daughter could handle making some pancakes with this….thanx for a chance to win it!!! Portion control is my biggest problem when it comes to food consumption. I can eat things that are good or somewhat good for me, but eat way too much, then it becomes not so good. I subscribe, follow, etc. No butter, portion control for me and my son LOVES pancakes. I already like both AFH and Anolon! We enjoy Swedish pancakes made in a similar shape/size when we visit relatives, it would be nice to make our own at home. i would really love to have this my family always loves making pancakes in the morning and this would be perfect for each of our portions. This would be great! I can never make smaller pancakes and its hard to get them not to stick. I would love to win the pan, I love pancakes and don’t know how to make them. this would be perfect size for my kids!!! Because it’s fun to make pancakes! i need to learn to make less size portions, this will b a huge help!! I can never get my pancakes a uniform size… maybe because I don’t have this pan?!?! Would love to use it and my girls would love it also! This would work out great when making pancakes for ou grandchildren. Perfect size portions! i get your newsletter, like you on fb and anolon, i would love to get this pan to make pancakes because i think eating smaller mini pancakes is easier than cutting up a big pancake! I would love one of these – not just for pancakes either – but it opens the door to other things like – eggs- hash browns, etc ….this would be such an awesome addition! We eat waffles or pancakes every morning! This would sure help the younger chefs perfect the fine art of pancake-making! I’d like to win the analon silver dollar pancake pan because our grandaughter likes them small sized but big on flavor! because I make a mess of pancakes in my frying pan! 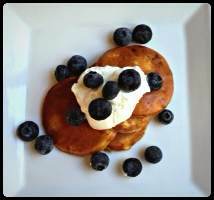 We love buckwheat pancakes with maple syrup! I’d love to win this pan. I could make perfect little pancakes for my kiddo’s. And it would be easy to clean up after. Sub’d to newsletter, liked on FB, and commenting….I would LOVE to win that pan!! My family, especially the kids, love pancakes, and this pan makes small perfect-sized ones. I have to have this pan!! Subscribed & liked. Oh my – that pan would really help with the portion sizes! And maybe my pancakes would be more consistent….oh, I can hope! What a great giveaway! I make very odd shaped pancakes…the kids always laugh 🙂 This would be perfect!! Thanks. I can make more than one at a time so I can cut down on cooking time. portion control, nonstick, thus not a lot of grease needed….what more can you ask for? I love the idea of smaller portions. Smaller portion, healthier,time saver, meal preparation for different times(i like pancakes alot so if I could make. Healthy, well balanced portioned pancake id have days worth. At one batch. Not a few giant ridiculous ones or ity bity ones lol. (fb liked tweeted,pinned,g+ will share on fb too try and refer more fans your way oh and already. Fans of both facebook pages. We’d make Sunday, Silver Dollar Pancakes Day…alreadly like both on Facebook! Thanks for the great fall breakfast idea. I would love to win the Anolon Silver Dollar Pancake Pan because my family loves pancakes. Preparing the smaller and healthier portion pancakes would be great. I would love to win. Thanks for the opportunity and chance. how fun! would love to make mini pancakes! would be easy to used. I would love it because I can’t make decent sized pancakes! I would love to have this because I have a hard time making pancakes that size. Also because I only have one good pan for pancakes and it takes me forever to make enough for 4 people! I make a lot of banana fritters for my family. They tend to get a little more oilier than I would like from frying. Blotting them on paper towels helps, but only a little. This pan looks to be the perfect alternative. Would love to try this one out! I’d like to win the pancake pan because smaller pancakes = easier portion control. I just love little pancakes! And big ones too!! I get the newsletter and like on Facebook. I would love to win this for making breakfast for my kids. My boys love silver dollar pancakes, but they always say I make them too big (not like their Mimi’s – my mom). I’d love to be able to make them these small pancakes more often! I love pancakes and this would help with the portion control. who doesn’t love silver dollar pancakes!..woo hoo! I need a pan that doesn’t burn my pancakes. I want it because I have grandchildren, and I can’t make them this nicely on my own. I can maybe make four, but they aren’t so perfect. There are so many different pancake recipes available and the Anolon Silver Dollar Pancake Pan. would be wonderful when we try out the recipes. Winners of the Analon Pancake Pans are: Donna M. Beth McC, Tara B., Susan C., Carly, Patty H., Christin A, Anthony, Denise M., Tammy C.
Wewill send an email to you directly for how to claim your prize.